I am a huge fan of personalized gifts. There is nothing nicer than receiving a gift that has your name or initials on it. You will never confuse your things with someone else's either. :) It has been several years since I have been able to leave the house with children AND my purse. I always take the diaper bag and just throw my things into it. Oh, how I have wished for a purse that could double as a bag for a few diapers and baby items as well as my purse! Today, I have news for you. Just because you are a mom doesn't mean you can't be stylish. I have found that having a monogrammed purse can make you feel very dressed up and always stylish...especially if you are a mom. I was a Greenville County First Grade teacher for over 20 years and always wanted to start my own business. I resigned nine years ago and started a monogramming/internet site. I have not stopped since -- I began manufacturing products that I always looked for in stores, but could never find. In 2008 we made the "O" list on Oprah.com and our internet business become a leader in Monogrammed Gifts. The Pink Monogram again made Oprah's favorite in 2010 when our High Heel Monogrammed Clogs appeared in the July 2010 Magazine. Monica sure does sound "real", doesn't she? I spend my days chasing around three small children and often wonder if I am going to survive the day. I don't know how she does it!! Hats off to her for her endeavors and for offering such cute and practical products. So, for this review I chose to receive the Monogrammed Ikat Bag. 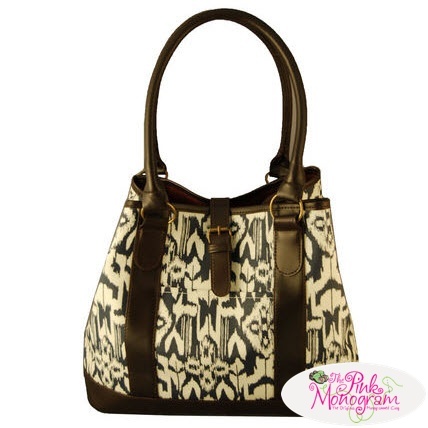 I was drawn to this bag because it looks really chic and modern...very cute too. The color of the bag I received is navy blue and the trim is brown. This bag also comes in brown red. 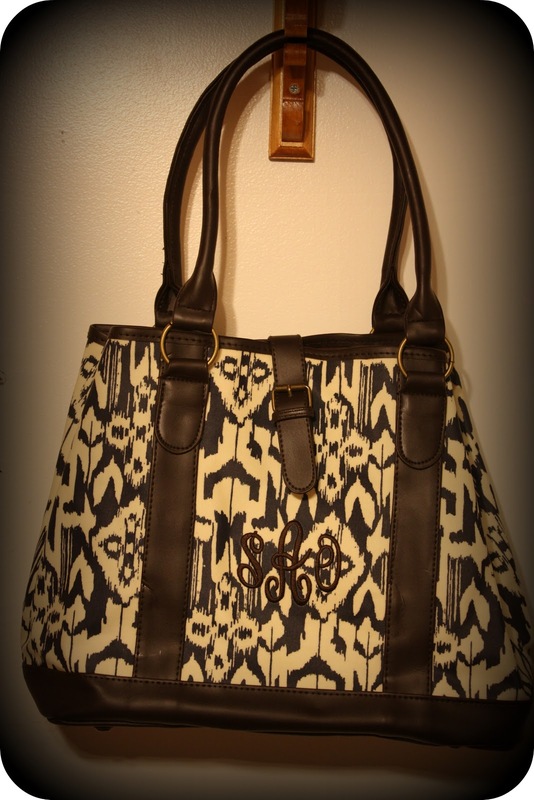 This bag has my initials monogrammed on the front of it...SAO. The font is very elegant and I love how they matched the thread color to the trim of the bag. When I recieved this bag in the mail I was shocked at how large it is! I was expecting a hand bag of sorts. You really cannot tell how big it is until you get it. Looking at the site now, I see that the dimensions are 15" X 12.5" X 5", which is NOT what I was expecting. This bag is totally amazing and not what I expected at all...so much nicer!! 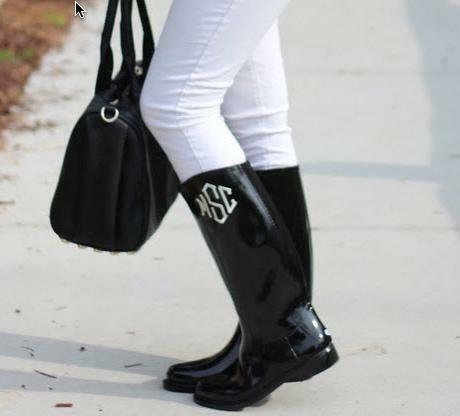 The only thing I don't like is that the monogram closes one pocket on the inside of the purse. It does say this on the description on their website, so it wasn't a surprise. I am just a bit surprised that there hasn't been a way to figure out how to monogram the bag without closing that pocket. No worries though...this bag has plenty of room so I am not worried about one pocket!! Not only does The Pink Monogram carry bags and purses, they also have iPhone and iPad cases, paper notes and cards as well as bedding and shoes! There are so many options and the prices are VERY reasonable. 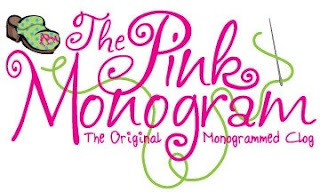 Be sure to check out The Pink Monogram on their social media sites including Facebook, Twitter and Pinterest! They have some really great Holiday Gift ideas so pop on over and see their wonderful selection for yourself. Disclaimer: I received no monetary compensation for this post. 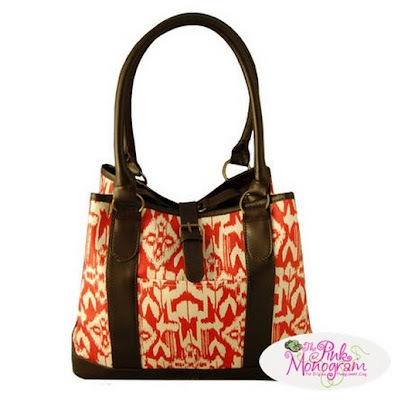 I did receive a free bag from The Pink Monogram for review purposes. All quotes and stock photos are from The Pink Monogram website and email. Prize is being provided and shipped by the sponsor. All thoughts and opinions are 100% mine. I love the monogrammed bed linens! I love the monogram interlock necklace! I love the interlocked necklace as well. So cute...That's one to keep forever...and as an heirloom! I love the Lime Green Monogrammed Wool Clogs. Our Trip to the Chicago Toy and Game Fair!